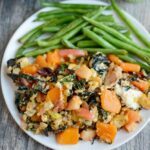 This Fall Vegetable Skillet Hash makes a quick, easy dinner (or breakfast) that’s easy to customize. Perfect for busy nights and packed with protein and vegetables! Preheat oven to 400 degrees. Place green beans on a baking sheet, spray with oil and roast for 12 minutes. While oven is preheating and beans are roasting, make the hash. Heat butter or oil in a large skillet. Add bacon, leeks and butternut squash and saute over medium high heat for 7-8 minutes. Place potatoes in a bowl, drizzle lightly with oil and microwave for 2 minutes. Add potatoes, swiss chard and apples to pan and saute another 5 minutes. Whisk eggs in a bowl, clear a space in the skillet and pour into center of the pan. Scramble eggs to the desired doneness and mix all skillet ingredients together until combined. Stir in cheese if using and serve warm along side roasted green beans.